Home Features & Opinions Analysis: Will South Africa’s ANC learn from Mugabe’s fall? Analysis: Will South Africa’s ANC learn from Mugabe’s fall? The silence of South Africa’s governing African National Congress (ANC), especially in the hours immediately after the fall of Zimbabwe’s President Robert Mugabe, was deafening. It showed the enormous psychological influence the one-time revolutionary wielded over the party – and it was so stunned by his humiliating exit that it was unable to respond to the momentous developments in the neighbouring state. In contrast, the main opposition Democratic Alliance (DA) reacted swiftly, capturing the mood of most both black and white South Africans when it said: “This is a victory for the people of Zimbabwe who have suffered greatly under the latter years of Mugabe’s reign. 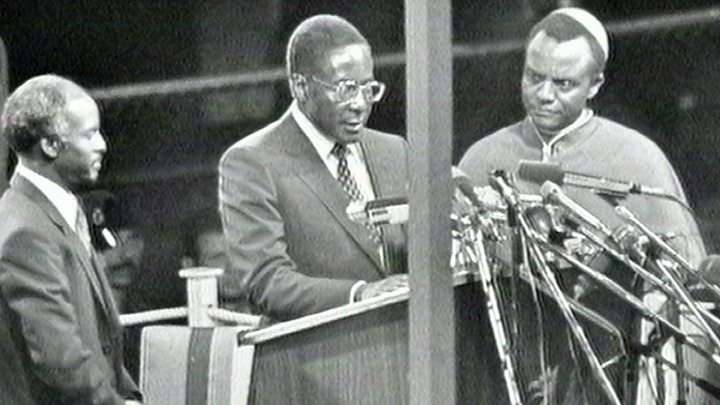 The story of Robert Mugabe is not a unique one, and is all too familiar on our continent. But this applies not only to Mr Mugabe, but to also to the party he led Zanu-PF, which has dominated Zimbabwe since sweeping to power at independence in 1980. As Zimbabwean opposition politician David Coltart poignantly remarked: “We have removed a tyrant but not yet a tyranny”. He was referring to the fact that one faction of Zanu-PF, led by sacked Vice-President Emmerson Mnangagwa, has ousted another, which had coalesced around Mr Mugabe’s and his wife Grace. 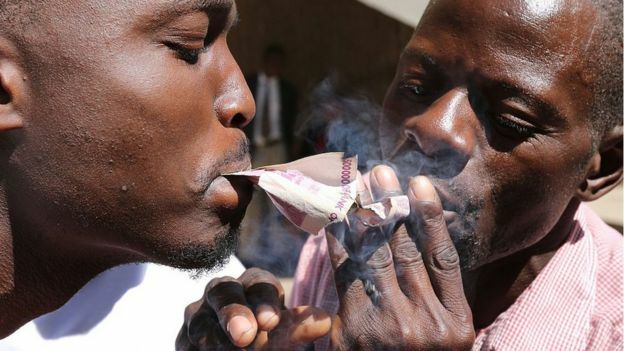 Like Zanu-PF, the ANC, which also took power at the end of minority rule, is wracked by corruption and violence, as rival factions fight to gain positions in government, primarily to enrich themselves rather than serve the nation. A former intelligence chief who has used the state apparatus to tighten his grip on power, South Africa’s President Jacob Zuma is spearheading a faction campaigning to install his ex-wife, Nkosazana Dlamini-Zuma, as the next president, leading South Africans to draw parallels with Zimbabwe. As South Africa’s respected newspaper columnist Max Du Preez wrote: “Nkosazana Dlamini-Zuma is no Grace Mugabe and isn’t married to Zuma any longer, even if she still [or again?] wears his wedding ring. In racially charged rhetoric similar to that of Mr Mugabe, the Zuma-led ANC faction has condemned “white monopoly capital”, has demanded land expropriation from whites without compensation and has warned of Western plots to oust the party. 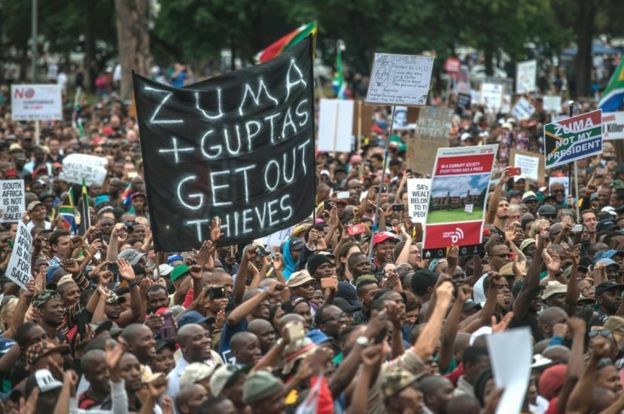 For the Zuma-led faction, the ANC, under the late Nelson Mandela, made too many concessions to white South Africans to end minority rule, and these have to be reversed. It matters little to them that South Africa’s economy could collapse, like Zimbabwe’s did after Mr Mugabe adopted policies that struck fear in the hearts of white Zimbabweans and Western investors. When ratings agency Standard & Poor’s downgraded South Africa’s economic rating some four months later, sending the currency into a tailspin, Water and Sanitation Minister Nomvula Mokonyane defiantly responded that “the West can’t dictate to us”. Her comments and those of Mr Maine show that the Zuma-led ANC faction is still steeped in the liberation-era mentality, when the Cold War rivalry between the Soviet Union and the US shaped the party’s thinking. Like Mr Mugabe, it wants South Africa to pursue a “Look East” policy – a point Mr Maine made when he called on the Youth League to compose a song entitled “Jacob Zuma, Economic Freedom Is In Your Hands”. “As we compose the song, can you [Mr Zuma] please be the Putin of South Africa?” Mr Maine said, referring to Russian leader Vladimir Putin. Mr Zuma himself has gone as far as to suggest that Western powers have tried to kill him, as he forges closer ties with Russia and China. “I was poisoned and almost died just because South Africa joined Brics [the Brazil, Russia, India, China and South Africa grouping] under my leadership, they said I was going to destroy the country,” he was quoted as saying in August. The Zuma faction is rivalled by a group backing Deputy President Cyril Ramaphosa. But Mr Ramaphosa is not a paragon of virtue either. A former business tycoon who became phenomenally rich after apartheid ended, he was implicated in the Marikana massacre when police shot dead 34 mineworkers and wounded 78 others in 2012. It was the deadliest police action in democratic South Africa, with Mr Ramaphosa being a director of the British Lonmin-owned mine where the shooting took place. Although a commission of inquiry cleared him of any involvement in the massacre, his critics took a different view. “You are the one who wrote emails and instigated the killing of 34 people,” opposition Economic Freedom Front (EFF) leader Julius Malema once told him in parliament. “And sitting there, your hands have got blood of innocent people who died in Marikana and I think it is important for you to accept that you are responsible for the deaths of 34 people,” he added. 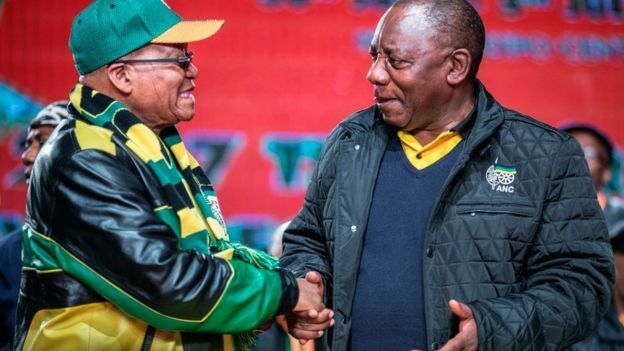 Although Mr Ramaphosa is a lawyer who was the architect of the liberal constitution South Africa adopted after the collapse of minority rule, he praised Zanu-PF in a solidarity message to its congress last year. “As ANC, we envy Zanu-PF and admire the manner in which the party holds its conferences with so many people gathered here, having serious political discussions on important issues that have to do with your own transformation process,” Zimbabwe’s state-run Sunday Mail newspaper quoted him as saying at the time. This may be rhetoric, as the ANC, unlike Zanu-PF, is democratic. 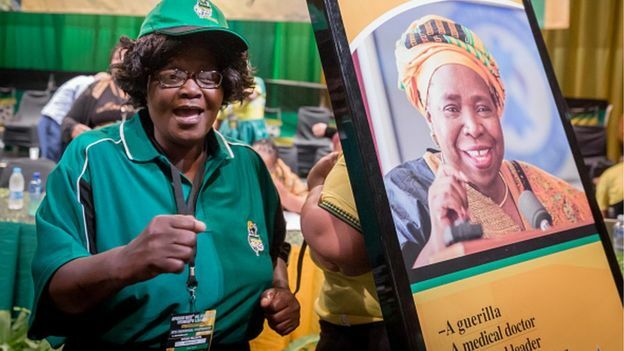 It has had three leaders since white minority rule ended in 1994, and is set to elect its fourth leader at its congress next month when Ms Dlamini-Zuma and Mr Ramaphosa go head-to-head in the battle to succeed Mr Zuma. This is in contrast to Zimbabwe, where Mr Mugabe was in power for 37 years. Nor is South Africa like its northern neighbour. As Daily Maverick news site columnist Stephen Grootes wrote earlier this year, South Africa is “a very different society”. “The biggest difference is that we are a proper multiclass society, which means that people vote in different ways, and fight for different things. It is not easy to completely dominate a multiclass society in the way that Mugabe has managed to do for so long. Nothing is really going to change that, even in the medium term,” he said. Nevertheless, there are worrying signs that the ANC could end up like Zanu-PF if it fails to rediscover its moral compass. In recent years, rival factions have killed for power. 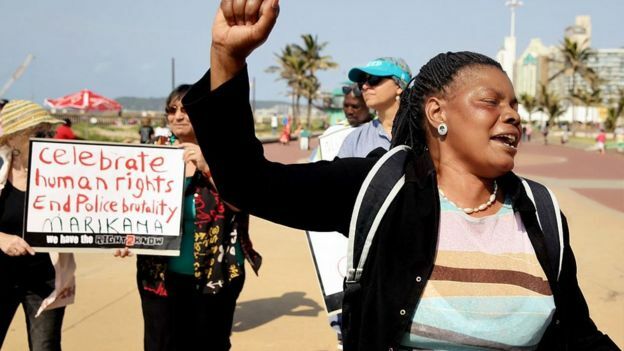 In Mr Zuma’s home province of KwaZulu-Natal, 35 people have been killed since last year, while violence has also marred ANC meetings in other parts of the country. If this does not end, South Africa’s reputation as a peaceful and stable democracy will be threatened. As leading South African cleric Bishop Malusi Mpumlwana warned in May, Mr Zuma’s government had “lost the moral radar”. “We have come to recognise that South Africa may just be a few inches from the throes of a mafia state from which there may be no return, a recipe for a failed state,” he said. 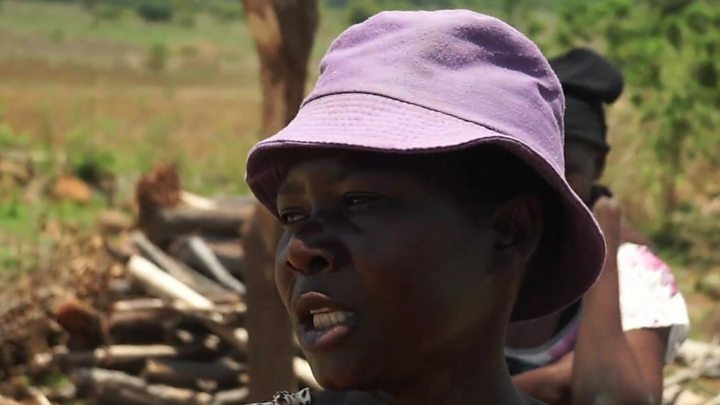 At the same time, the ANC’s electoral base is becoming increasingly like that of Zanu-PF – mainly rural, as urban voters, and racial minorities, abandon it because of the corruption within its ranks, and its failure to tackle high levels of unemployment. But as the protests and celebrations of recent days in Zimbabwe showed, the ANC would be well advised to once again become a party which appeals to voters across racial and class lines. In its editorial after Mr Mugabe’s resignation, Zimbabwe’s state-run Herald newspaper noted: “The overwhelming majority of the marchers on Saturday and those in the impromptu celebrations last night were the younger generations, young men and women in their twenties and thirties who had been born and had grown up in a free Zimbabwe. It showed the need to transcend the bonds forged in the liberation struggle, and to rally the entire nation to tackle deep-seated economic and social problems.